The manufacturing industry is challenged by shorter product life-cycles and customized products. Modular, reconfigurable production systems are seen as potential enablers for cloud-based manufacturing to cope with these challenges. However to date, there has been little development of flexible and modular grinding machines. Driven by the vision of a cheap, modular machine for the DIY user or for rural, remote areas, a small foot-print grinding and 3D printing machine has been developed from programmable components, the Barobo Mobots. 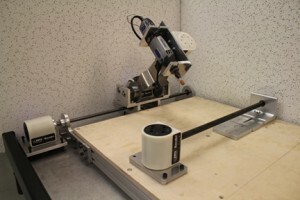 The first prototype can be switched from a cylindrical grinding setup for round parts to a gantry design for three-dimensional tool paths within minutes. The system has been improved for higher stiffness, torque, precision, and user friendliness. New motor modules with higher torque have been developed. 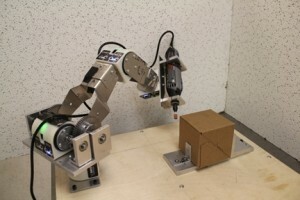 The machine control has been based on NI LabVIEW. Figure: Outer diameter grinding (left) and freeform grinding (right) configurations of multipurpose grinding machine.